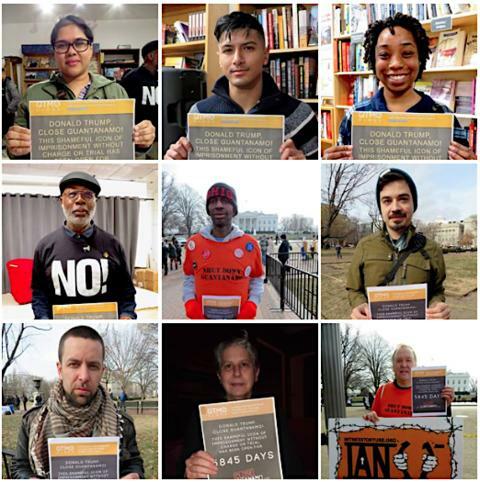 April 11, 2019 marked 6,300 days since the "war on terror" prison at Guantánamo Bay opened, and here are some of the people urging Donald Trump to close it once and for all. The next big date is July 20, when Guantánamo will have been open for 6,400 days. 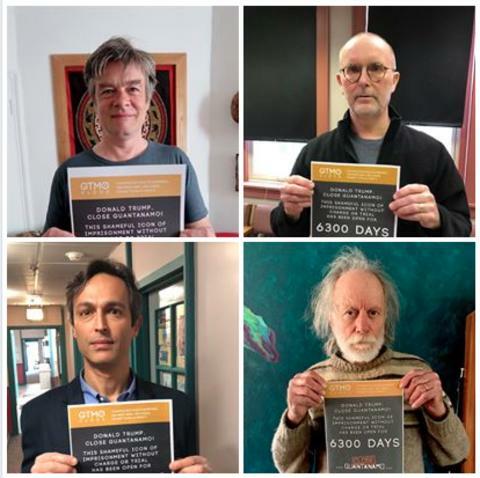 Please take a photo with the 6,400 days poster, and send it to us. Donations to support the work of the Close Guantánamo campaign are welcome and greatly encouraged. Please click on the "Donate" button below to pay via PayPal. If you can make a regular monthly donation, please tick the box marked, "Make this a monthly donation," and fill in the amount you wish to donate every month. Some of the people calling on Donald Trump to close Guantánamo, with posters from our Gitmo Clock initiative, which counts, in real time, how long Guantánamo has been open. See all the 2018 photos here and photos from 2018-19 here, and please join us! Also see our press release, issued with ten other human rights groups, on June 10, when the prison had been open for 6,000 days. Andy Worthington's interview with Chris Hedges about Guantánamo, broadcast in March 2019. For our report about events marking the 17th anniversary of the opening of Guantánamo, see The Revival of Resistance: Reflections on the 17th Anniversary of the Opening of Guantánamo, and see below for the video of the panel discussion at New America featuring our co-founders Tom Wilner and Andy Worthington, and Laura Pitter of Human Rights Watch. The panel discussion about Guantánamo at New America on Jan. 11, 2019. Please also read our most recent article, Supporting Whistleblower Chelsea Manning, Imprisoned for Refusing to Testify in Grand Jury Case Against WikiLeaks, about the sad and unjust imprisonment — again — of whistleblower Chelsea Manning, who, of course, delivered to the world the classified military files from Guantánamo that Andy worked on as a media partner at the time of their release in April 2011. Also check out As Mohamedou Ould Slahi is Denied a Passport, Remember That All Former Guantánamo Prisoners Live Without Fundamental Rights, an important article about how former prisoner, torture victim and best-selling author Mohamedou Ould Slahi is still subject to restrictions on his liberty over two years after his release from Guantánamo, in which we also discuss how all former "enemy combatants" have no fundamental rights, Alarm as Proposals Emerge to Send ISIS Prisoners to Guantánamo, and the U.K. Strips "ISIS Bride" of Her Citizenship, about the latest disturbing news regarding foreign fighters and their wives and children in Syria, and Saifullah and Uzair Paracha: Victims of U.S. Vengeance in the “War on Terror”?, a cross-post, with an introduction by Andy, of a detailed Guardian article by the Pakistani journalist Saba Imtiaz looking at Guantánamo's oldest prisoner and his son, imprisoned in the U.S. since 2006, which asks whether they were "wrongly snared," and compellingly suggests that they were. We also recommend other recent articles; namely, Remembering Judge John J. Gibbons, The Man Who Brought Habeas Corpus to Guantánamo, about the recent death, at the age of 94, of the former chief judge who argued for the prisoners' habeas corpus rights before the Supreme Court in 2004, Guantánamo’s Periodic Review Boards: Eight Men Entombed by Donald Trump, looking at the scandal of the Periodic Review Boards under Donald Trump, which have gone from a functional parole-type system under Barack Obama to a kind of Groundhog Day process, in which those reviewing the cases of the men eligible for the PRBs seem to have no interest whatsoever in approving any of them for release, and Guantánamo’s Lost Diaspora: How Donald Trump’s Closure of the Office Monitoring Ex-Prisoners Endangers U.S. National Security, looking at how Trump has also made post-Guantánamo life insecure for many prisoners, as well as failing to keep America safe. Also check out WORLD EXCLUSIVE: "The Kind Father, Brother, and Friend for All at Guantánamo" by Mansoor Adayfi, very generously written for us by former prisoner Mansoor Adayfi, who was resettled in Serbia in 2016, and Karen Greenberg on Brett Kavanaugh, and How Guantánamo is Poisoning U.S. Law, a cross-post of an incisive and damning analysis of the confirmation, as a Supreme Court justice, of Brett Kavanaugh. For a brief explanation about why it is imperative that Guantánamo is closed, see our co-founder Andy Worthington speaking outside the White House on January 11 last year, the 16th anniversary of the opening of the prison. The poster showing 5,950 days of Guantánamo's existence, on Apr. 26, 2018. Please visit our new campaign pages (for 2018, and 2018-19), showing photos of opponents of the prison at Guantánamo Bay with posters telling Donald Trump how long Guantánamo has been open — 5,845 days on January 11, 2018, the 16th anniversary of the opening of the prison, and 6,210 days on January 11, 2019 — and urging him to close it once and for all. 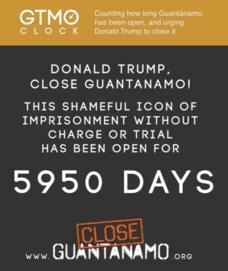 To print a poster visit the Gitmo Clock website, which we first launched in 2013 and revived in 2018. We've now made new posters available for 2019. Take a photo, and send it to us, with, if you wish, a message for Donald Trump. You can take photos with as many of the posters as you wish throughout the year! See here for the events we were involved with on the anniversary, read our introduction to the photo campaign here, read our co-founder Andy Worthington's account of the anniversary here, see Andy's photos of the protest here, follow us on Facebook, and check out the videos below — of the panel discussion that Andy and our other co-founder, Tom Wilner, took part in on the afternoon of Jan. 11 at the New America think-tank (with Karen Greenberg of Fordham Law School), and of Andy's talk on Jan. 16 at Revolution Books in Harlem, introduced by and moderated by Carl Dix. The New America panel discussion on Jan. 11, 2018. Donald Trump No! Please Close Guantánamo! Please watch our video in which, throughout 2017, we asked supporters to take photos of themselves with posters urging Donald Trump to close Guantánamo. The video features the song, 'Close Guantánamo (2017 mix)' by Close Guantánamo co-founder Andy Worthington's band The Four Fathers, and is available to listen to or as a download on their Bandcamp page. Please also check out 'Equal Rights and Justice For All,' a rousing defense of habeas corpus, released by The Four Fathers to mark Trump's first 250 days. Please also read Andy's article from the fall of 2017 about the disturbing news that the administration is no longer monitoring hunger striking prisoners, entitled, Celebrities Fasting With the Hunger Striking Guantánamo Prisoners That Donald Trump Is Allowing to Die. Andy also wrote an article for Al-Jazeera about efforts to hold the government to account in court. A petition that may be of interest is designed to get the Trump administration not to destroy prisoners' art, following the recent revelation that officials are no longer allowing prisoners to keep their art, or to send it or give it to other people (their lawyers and family members, for example), and have also threatened to destroy it. Andy wrote about that in an article entitled, The Persistent Abuse of Guantánamo Prisoners: Pentagon Claims It Owns Their Art and May Destroy It, But U.S. Has Long Claimed It Even Owns Their Memories of Torture, also looking at the dark undercurrent of the authorities' desire to have total control over the prisoners that has always existed at Guantánamo. Please also read our article about Nils Melzer, the U.N. Special Rapporteur on Torture criticizing the U.S. for still using torture at Guantánamo, and, for some perspective on who is still held at the prison, please also read Abdul Latif Nasser: Facing life in Guantánamo, Andy Worthington's article for Al-Jazeera from June, looking at the five men still held who were approved for release under President Obama, and especially looking at the case of Abdul Latif Nasser, a Moroccan who missed being released by just eight days. We are a group of lawyers, journalists, retired military personnel and concerned citizens seeking to close the "war on terror" prison at Guantánamo Bay, where 40 men are still held, 5 of whom have been cleared for release. January 11, 2018 was the 16th anniversary of the opening of the prison at Guantánamo Bay, and the start of its 17th year of operations. This is an anniversary that should never have come to pass. The prison at Guantánamo Bay is an abominable experiment in indefinite detention, which poisons America's claim to be a nation that believes in justice. Of the 5 men still held but approved for release, some have been waiting to be freed for seven years, which is unforgiveable, and others have been approved for release more recently by Periodic Review Boards, a process established in 2013 to review the cases of all the prisoners not already approved for release or facing trials. Just nine men are facing or have faced trials, while the men who had faced PRBs were, disgracefully, either recommended for prosecution until the military commissions largely collapsed under judicial scrutiny, or were described as "too dangerous to release" when President Obama's task force reviewed their cases in 2010, even though it was acknowledged that insufficient evidence existed to put them on trial; in other words, it was not evidence at all, but profoundly unreliable information derived through the use of torture, abuse and the bribery of other prisoners. Please visit our project launched at the end of 2015 — the first detailed annotated list of all the men facing Periodic Review Boards, which, to date, have approved 38 men for release, while approving the ongoing imprisonment of 26 others (a success rate for the prisoners of 59%), and please read our article introducing the list. Also, please look at our updated prisoner list, identifying the 40 men still held, and incorporating the decisions about whether they should be freed, tried or held indefinitely. These decisions were made by the Guantánamo Review Task Force in 2010, but were only made public in June 2013, as discussed in our article, "The Guantánamo Review Task Force's Decisions on Who to Release, Who to Try and Who to Hold Indefinitely Are Finally Released." Please encourage your Senators and Representatives to support our call to close the prison. Let them know that, while the prison remains open, it undermines America's values and national security. Find your Senators here, and your Representatives here. Join us now to help end this injustice and restore the rule of law. We call on Donald Trump to close Guantánamo, and will continue to do so until it is closed for good. Your voice matters. Thank you for your commitment and support, and thank you for your interest in bringing this dark chapter in modern U.S. history to an end. Please see our mission statement for a more detailed analysis of why Guantánamo must be closed, and to see the list of prominent individuals and organizations who have signed it. Remembering the "Countdown to Close Guantánamo"
In November 2016, we launched this video (also on Facebook) encouraging supporters to join us in our renewed efforts to persuade President Obama to do all he could to close Guantánamo before he left office. The video was part of the Countdown to Close Guantánamo that we launched in January 2016. Please feel free to check out the campaign song by The Four Fathers, and the revised version — plus video — reflecting America's dubious new presidency, and Obama's sad and shameful failure to fulfill his promise to close Guantánamo. Please see the Celebrity Photos page for photos of our celebrity supporters, including music legend Roger Waters (ex-Pink Floyd), the musician and producer Brian Eno, David Morrissey, Juliet Stevenson, Clive Stafford Smith of Reprieve, and former Guantánamo prisoners including Shaker Aamer. Also see the first Public Photos page for photos from 1 year to 300 days, the second page for photos from 250 days and 200 days, the third page for photos from 150 days and 100 days, and the fourth page for photos from 70 days to 20 days, and the fifth and final page, plus messages to President Obama from concerned members of the public from the U.S. and around the world. We are delighted to report that over 700 photos were submitted by supporters of the campaign. Please also see the video of Roger Waters and Andy Worthington announcing the launch of the "Countdown to Close Guantánamo" on Democracy Now! with Amy Goodman.